Nice looking car, not M4 drivers level but appears to be a great highway cruiser. These things are a pretty decent deal when found used and are definitely a consideration currently. They're as reliable as any other modern Lexus. I wouldn't call it a highway cruiser though. It's not quiet and the ride isn't particularly cushy but overall I like them. Styling is too extreme for me to consider purchasing. Why not a GS-F? Only 70lb heavier, probably drives 99% the same, but is 5x more practical. I guess it depends what you want/why you like the RC-F. I think the RC looks better than the GS but it's not small or light enough to warrant the worse usability. I think these look fantastic but I had no idea they make a Track Edition. My boss had an RC350 F (not quite apples to apples, but close). He was very happy with it and took it on plenty of trips. Ride is noticeably harsher than a normal Lexus "cruiser" (stiffer suspension + low profiles). Reliability will be good like all Lexus'. No idea what fuel economy is like - probably not amazing for a heavier V8. 2016 Golf R 6MT - Deep Black Pearl - SOLD! I agree that the RC-F looks better. But not good enough to basically be a 2 seater. But not good enough to basically be a 2 seater. Depends on if you care. I've got a two-seater coming on purpose. On paper there's a lot out there that performs better with the same badge cachet, or has the same perf but "worse" badge etc. In the real world, they're well built, reliable sporty GTs that should hold their value pretty well. great sounding NA V8. I was down on them when they first came out, but now I'd have a hard time picking up a european competitor if I didn't need a man pedal. Guy I work with has one and I always find myself admiring it in the parking lot. A used one for 50% off seems like an amazing value in a GT car. I want one. That's what has me interested in them. They're easily in the mid 40s for a 14/15 with lease mileage on them. They'll seat 4 in a pinch. they look good, not great, just good, and they have some performance chops. More I think about what I want, it's a reliable GT with some performance chops. I'd kill for a 3rd pedal, but there's really nothing out there in 2dr cpe form as a GT with a 3rd pedal that's something i'd feel comfortable putting 100k miles on and not having to do any crazy maintenance to. Fantastic cars. I'm personally going GS-F for my wife, but the RC-F is wonderful. It is a great blend of luxury and performance. The car is quiet in Eco mode, but gets really loud in Sport and Sport+ when the extra induction flap opens up. Rear leg room isn't great, but it's no worse than the ATS, IS-F or XE. Headroom is better than most cars in the class if you do not get the moon roof due to no choptop design or ridiculous rake in the rear. There really are no reliability issues other than the leather creasing and the Lexus infotainment system being awful. If you buy one, I would retrofit AA/CarPlay ASAP. Also, the TVD is insanely expensive to purchase if it fails ($10,000+). Edit: Also, no to the RS5. I'm sorry, but documented oil burning issues, sensor failures, electronic niggles, window regulator issues, DCT maintenance and carbon build-up problems equals a hard no to me. Just get the car that's RWD and built to a higher standard. Also, that interior is yawn inducing. It reminds me of my Golf R.
Last edited by unhappymeal; 04-15-2019 at 10:03 PM. Where are these oil burning issues? I own one and itll burn a quart in 5k miles of abuse which is about standard. No electronic problems on mine nor have I seen many on forums. DSG service is not cheap this is true. GS-Fs have been on my bargain radar for a while now, and given I'm a sucker for fast four-doors, I haven't looked into the RC-Fs too much until now. But WOW - yeah these are a bargain. I think I could get over the looks to have a big, comfy, Japanese-reliable, fast V8 coupe for the same price as a new loaded Mustang GT. It sounded freakin' awesome at Long Beach last year. That's the only opinion I have. Hell, you know those ancient cave paintings in France? I betcha those animals were really half the size that the hack scribbler drew. I went on a hard drive with one that had headers and a Borla exhaust. It wasn't amazing in the corners but sounded really, really good. I like that this color is available. I personally was always more partial to the GS-F. I see what you mean, and the first time I saw it, I was also not immediately sold on it. But over time it grew on me. It fits the style and character of the car. The exterior of the car is elegant and stately. It would be a good sleek anonymous black car for some kind of discrete services, or some other. I was personally considering a GS, mainly because that interior is nearly unparalleled... but the rear seats not folding down killed it for me. As far as the RC goes, what I don't like is how the headlights somehow have this vertical segment (at the inner "bulb") halfway down to the DRL's. It ruins the line of the front end IMHO. I think the GS-F and RC-F are both underrated vehicles. I see probably 3-5 M cars for every F car, which I prefer not seeing my vehicle everywhere I turn. I'd go for it, in fact pending the state of the market in two years when my lease is up these cars are on the short list. It appears there are not Track Package RC-Fs on the usual sites. Track Package gets you the TVD. I’m really trying to find out what’s most important on this car. Also, how do you retrofit AA/CarPlay to them? The Performance Package gets you a carbon fibre roof (no moon roof) and the TVD. Car and Driver finds it's faster and requires less steering angle in the slalom with the TVD. The flip side is it's a $10,000+ part to replace if it fails and some prefer the Torsen because it makes the car more tail happy. The Track Package is new and gets you more carbon fibre body panels, new forged wheels and a titanium exhaust. Last edited by unhappymeal; 04-16-2019 at 11:31 AM. Track pack is also a relatively new thing right? like maybe this MY or the previous? I was personally considering a GS, mainly because that interior is nearly unparalleled... but the rear seats not folding down killed it for me. I keep forgetting that Lexus did that. 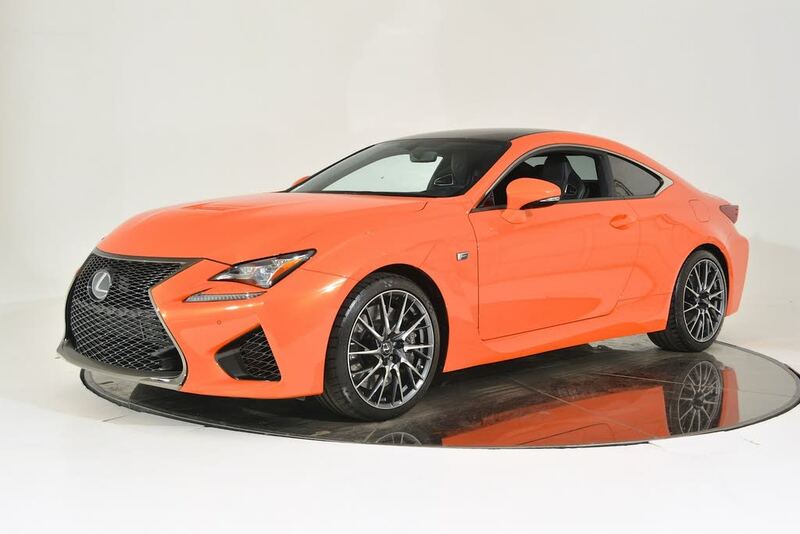 I guess I'd only be interested in the RC350, not the RC-F. Sad! If you are not finding models with the TVD, it means most buyers either wanted the moon roof or didn't want to pony-up another $8k for the performance options. Last edited by unhappymeal; 04-16-2019 at 11:32 AM. Pics from the Parts4VWs Driver Education Event at Pahrump!! !